Softer than the regular kind, this is a delicate, melt-in-your-mouth shortbread. The original recipe I found (originally to make a Viennese cookie, vanillekipferl) used regular flour but I replaced it with white rice flour and I substituted the butter with coconut oil. Make sure that the coconut oil is soft, at a spreadable consistency; it shouldn’t be liquid. If necessary, refrigerate it until the oil is solid (when it’s solid, it’s white in colour), at a spreadable consistency but not hard. Following the original recipe, I did use confectioner’s sugar (also known as icing sugar and powdered sugar) since I had it on hand but if you wish to have your shortbread sugar-free, replace the sugar with coconut sugar or coconut sap, an ingredient that I recently learned about and that I’ve been experimenting with lately. I have not yet tried making this shortbread with honey. I don’t think coconut sugar is SCD legal – correct me if I’m wrong – but it is suitable on a GFCF diet. Coconut sugar has a low glycemic index and it can be used to replace sugar on a one to one ratio, i.e. 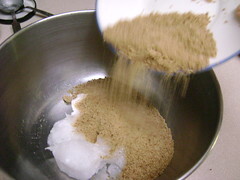 replace 1 cup sugar with 1 cup coconut sugar, and so on. For this reason, I’ve included separate instructions for the shortbread made with confectioner’s sugar and the shortbread made with the coconut sugar. When made with coconut sugar, the dough is moisture as well as firmer and less likely to crumble or tear when it’s rolled out, and it’s distinctly crunchier since coconut sugar isn’t as fine as confectioner’s, although it is a much softer cookie. The first trial cookie was a lot firmer than the second trial cookies, though. Note: please, don’t let the instructions or the temperamental nature of the shortbread dough deter you. These are incredibly simple shortbread cookies to make, they’re just attention-demanding! I didn’t intend to make this entry so long, but I didn’t feel I should leave anything out that I’ve learned from making this shortbread. Preheat oven to 350ºF and line a baking sheet with parchment paper. 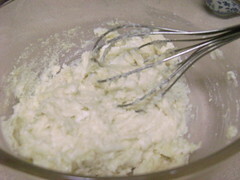 Using a whisk, cream the coconut oil and confectioner’s sugar together until just combined. 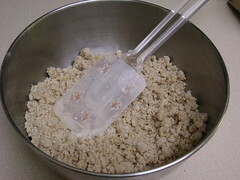 Using a spatula (preferably flexible), mix in the almond flour and add the extracts. Gently fold in the rice flour and salt, mixing until the dough starts coming together. Add the water. The dough should feel dry and crumbly between your fingers. 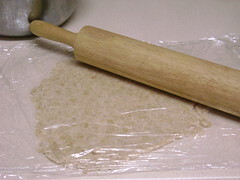 Between two sheets of plastic wrap, roll out a small amount of dough. Using a cookie cutter, cut out cookies and carefully transfer to the baking sheet using a thin spatula or flipper. If the cut cookies are difficult to transfer, i.e. sticking to spatula and/or tearing apart, cover the cut cookies with the second sheet of plastic wrap and chill in the freezer for 3 minutes to firm them up. (Chill any longer and it will be difficult to roll the dough. See following rescue tips.) While still firm, you can use your hands to move the cookies to the baking sheet. 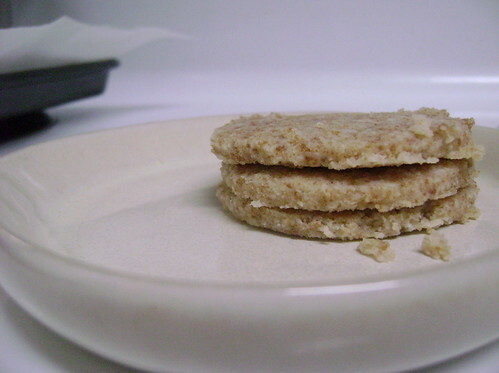 Let the remaining dough from cutting the cookies soften before re-rolling. Bake the cookies for 10 minutes. Though they don’t spread, they may puff up a bit. Remove from oven and let the cookies cool on the pan for a few minutes before removing. 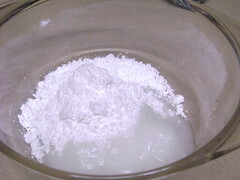 Rice flour products are especially fragile and crumbly when they first come out of the oven. When cooled, they should be firm enough to hold in your hand with out breaking or crumbling. Enjoy! Preheat oven to 250ºF. Line a baking sheet with parchment paper. Whisk the coconut oil and coconut sugar together until it forms a paste. Add extracts. Using a spatula (preferably flexible), mix in the almond flour. Gently fold in the rice flour and salt, mixing until the dough starts coming together. The dough will be moist and should form little balls. Roll out the dough between two sheets of plastic wrap and cut out cookies, transferring to the prepared baking sheet with a spatula. While rolling out the dough, it may soften with repeats, so you may briefly chill it in the freezer for a few minutes to firm it up again. Bake the cookies for 15 minutes. (You can bake them for a longer period, up to 30 minutes at least, if you wish.) Remove from the oven but do not try to pick up the cookies until they’re thoroughly cooled. When they first come out of the oven, they will be extremely soft – too soft to pick up without breaking and crumbling. Even once they’ve cooled, they’ll still be relatively soft, so still be very careful when picking them up (I used a spatula). 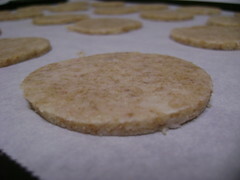 Though this mainly applies to shortbread made with confectioner’s sugar, some principles may be applied to the coconut sugar shortbread. The shortbread dough is relatively temperamental. It isn’t suitable for making in advance as the dough melts depending on weather or how warm your kitchen is (from heat such as other appliances running) due to the oil content from the coconut oil. If it’s chilled for a prolonged period of time (including storing in the fridge) the dough can’t be rolled out properly because it’s too hard. No amount of letting it warm to room temperature seems to fix the second issue. Melted dough can be salvaged by putting it in the fridge or freezer for a few minutes, until it’s firmed up enough that it can be rolled out and cut into cookies. The cookies will spread a bit while baking. Dough that’s been stored in the fridge or freezer for too long can also be still used. Instead of rolling out and cutting into cookies, press the dough with your hands into a pan lined with parchment paper. 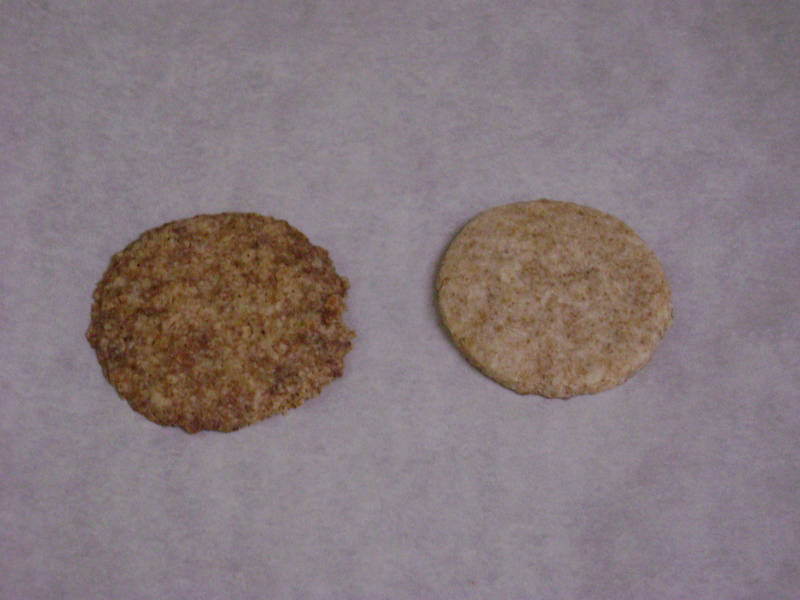 Bake at the oven temperature for appropriate length of time based on the kind of shortbread (confectioner’s sugar or coconut sugar) dough, following instructions above. 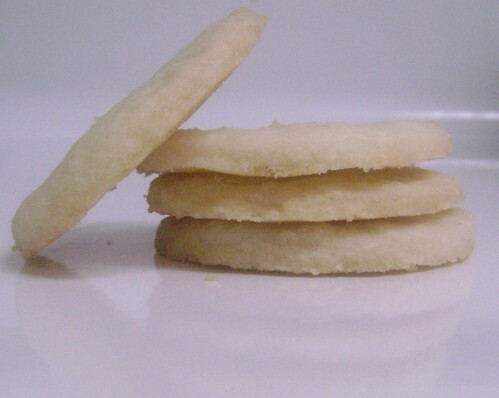 The pan shortbread can be cut into pieces after it’s cooled.